The lessons inside “By Hand & Eye” cannot be learned by reading alone, any more than you can learn to cut dovetails from a book. It was well-worth doing and has absolutely made me a better designer. 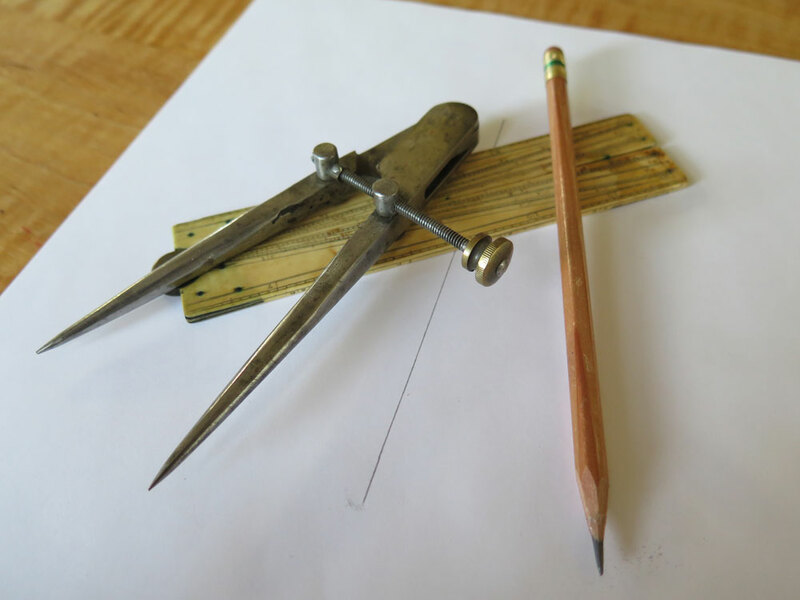 This week we had a reader who was struggling with the first drawing exercise in the book called “Making a Visual Scale.” In that exercise, you are asked to make seven rectangles using a compass, straightedge and pencil. Tolpin and Walker are purposely a little obtuse about the process to make the rectangles because it’s important that you make a small mental leap yourself. To help the reader, George offered a small nudge on his blog yesterday in this entry. If you have been struggling with this exercise (or skipped it – naughty, naughty), here’s the chance to wake up your inner eye this Saturday. Give it a cup of coffee. For those of you who don’t own the book, here are the four pages from the book in pdf format so you can try it yourself. If you like this sort of thing, you are going to be thrilled by an upcoming and inexpensive workbook from Tolpin and Walker. The workbook answers this question: Can you learn design from a cartoon dog? More details to come. P.S. “By Hand & Eye” is back in stock in the Lost Art Press store after we sold out of the last printing. This entry was posted in By Hand & Eye, Downloads. Bookmark the permalink. Agreed. That exercise revealed how much my mind was over complicating proportions. Looking forward to the workbook, since these are probably the only exercises I can do whilst drinking. So you were able to get dividers through TSA security? “Purposely a little obtuse about the process” is an obnoxious way to write a book designed to inspire and train the reader in something new. What if failure to bridge the gap causes the reader never to undertake the exercise? To date, By Hand & Eye is the only Lost Arts Press book in which I’ve been disappointed. I may be in the minority in saying this, but it felt like an unfocused, disjointed effort. Perhaps my expectations were too high, though, or I read it at the wrong point in my woodworking journey. I recall liking the “Waking Up Your Eye” chapter quite a bit. I wholeheartedly agree. I wrote what’s below the line in response to the blog entry Chris links to. A later comment got through moderation. Mine must have ruffled some feathers. I raised some pretty basic issues with the post. So, in your post from 2010 on the Golden rectangle you say: “If you overlay the golden rectangle over any complicated piece of furniture you are bound to find something that will coincide. … I don’t care if a proportion lines up with some random drawer, that’s not how you build furniture and is meaningless.” When I see diagrams like the one you have above that’s exactly my reaction. You have two circles each with their centers on the other’s edge. That looks meaningful in some way, but it’s hardly the easiest way to draw a 2 x 3 rectangle. Similarly, your construction of the 4 x5 rectangle is probably the most difficult way I could imagine to draw that. I can’t even think of a reason to approach it that way. But back the 2 x 3 rectangle. Sure it’s there in the table drawing, but relates in no way to the overall width to height ratio and only fits where it does because it is tangent to the upper surface of the table and the inner faces of the legs. The mysterious wave thing floating over the top doesn’t seem to have any identifiable proportions “harmonic” or not and again does not address or relate to the whole form, nor apparently the circles. The black and white vertical bar on the left again does not divide the whole height of the table, it divides the height from the underside of the top disconnecting the resulting divisions from the circles which are supposedly the basis of the proportioning system. The bar on the right is based on the left bar, so it’s also unrelated to the circles. It’s an OK table design, but why the mumbo jumbo to justify it? I would argue that in reality for most people the study of theoretical proportioning systems is an esoteric subject that will do less to train the eye for good design than a life drawing class might. That’s especially true when examples given don’t illustrate the subject at hand very well. If you do want to take the subject seriously, there is a lot more to it than simply drawing circles over your sketches. Rob Krier’s “Architectural Composition” is a great bargain used. Chapter IV “On Proportions” covers the subject of its title very thoroughly. I do not drink this early in the day but this might change my mind. Another book I would recommend as complimentary to “By Hand and Eye”, is “Sacred Geometry”. I searched Amazon for “Sacred Geometry” and got multiple hits. Who’s the author? Dave, it is “Sacred Geometry: Philosophy and Practice” by Robert Lawler. I thought you could just walk of the radius around the circle to divide a circle into sixths. This would give you your thirds, or am I missing something? Nevermind. Wrong kind of thirds. I spent the last two day at work dissecting the golden ratio due to a cheap book I found at Barnes and Noble called 3o second math. It’s a good thing to have open when reading by hand and eye. It explains into the weeds, the background details, which made my understanding of Jim’s book easier. Great post. By Hand & Eye is one of my favorite books. It has gotten some good press at the following site, in case you hadn’t seen their posts. I really love this book. I’m starting to work through the exercises in the first half and like where it’s taking me. Building a square around a circle was an interesting first step. I’m looking forward to going through all of the exercises and continuing to develop my vision for the way projects are layed out.